Treatment (or avoidance) of headaches depends on the type of headache you have. In general, good habits can help you reduce your risk of headaches. Get plenty of sleep, exercise, and drink plenty of water. Make sure you’re getting enough potassium and magnesium, and don’t drink too much alcohol. These are good rules to live by regardless, but especially helpful for minimizing headaches. Tension headaches: Stress, a bad night’s sleep, or other factors can trigger a tension headache. They are the most common and least painful of headaches. Anti-inflammatory medicine, rest, and in some cases caffeine can help when these hit. 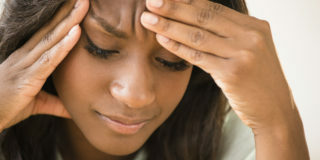 Migraine: Throbbing, consistent pain lasting anywhere from hours or days are the hallmarks of a migraine. Migraines can be accompanied by sound and light sensitivity, blurry vision, and nausea or vomiting. Some people are able to wait it out, but for those who regularly suffer migraines should speak with their doctor. He or she can prescribe beta-blockers, calcium channel blockers, antidepressants, or anti-seizure medications which all appear to help. Herbal and supplemental options include coenzyme Q10, feverfew extract, magnesium, and riboflavin. Cluster headaches: Piercing pain and multiple attacks in a short period of time define this type of headache. Oxygen treatments can help reduce the pain of cluster headaches, as well as injectable steroids, certain types of migraine medication, and local anesthetics. In some severe cases, your doctor may recommend surgery. Sinus headaches: Most often caused by illness (such as sinus infections, colds, or the flu) or allergies, sinus headaches affect the forehead and face and are caused by congestion and pressure. Drinking plenty of fluids will help your body get rid of the sinus pressure and congestion. Decongestants (either over-the-counter or by prescription), steam, and essential oils may also help. Hormone headaches: Women get these kind of headaches when pregnant, during their periods, during menopause, or when switching or starting birth control pills. Over-the-counter pain relievers are useful here, along with applying ice, distressing techniques, and even acupuncture. As always, consult with your doctor before self-treatment. Headaches can ruin your day or even multiple days. If you’ve been experiencing headaches, be sure to speak with a primary care provider to determine the best solution for you. To make an appointment with Dr. Nwabara, call 219-885-4264 today or request an appointment online here.